Your environment friendly homemade electrical vehicle (EV) might have clutch and whether you carry on with it or not, is entirely up to you. However, there are advantages as well as disadvantages to any method that you adopt. You are going to feel that with the help of a clutch, you can change gears of your EV faster during emergencies or even otherwise; however, setting up the gears can prove to be too complicated for you. You might feel that without clutches you reduce the weight of your vehicle by 25 pounds, which allows you to install extra batteries without exceeding the vehicle’s permissible weight. But this might again make you feel that you are taking double the time to shift gears and therefore, take your decision after considering as to whether you want to have your vehicle clutchless or not. 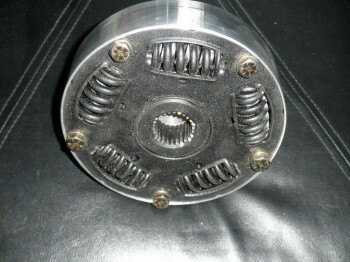 To drive your DIY electric car without clutch, you have to connect your car engine directly to the gearbox. For this purpose, an adaptor made from old clutch plate can prove to be useful. It connects the motor shaft tightly with the gearbox input shaft, thus nullifying the chances of the engine getting disengaged. Remove entirely the assembled clutch section – the flywheel, peddle, etc. since in modern manual transmission method none of these are used and instead a system called syncro’s is in place between each gear. This system does the work of a clutch for the gears. When you press or release the gas pedal of your car, these syncro’s create a perfect synergy to match the speed and crunch-free meshing before the gears come into contact, thereby bringing the gears to the correct speed. The fact that electric motor has very little mass as compared to an internal combustion engine; it enables the syncro’s in the gearbox to match the internal speeds quite quickly, thus allowing the proper gears to be selected. If you want to change gears of your vehicle, first take your foot off the accelerating peddle and then put the leaver into the neutral mode. After this, introduce the gear leaver to your desired gear; however, you should do this gently and slowly and should not exert too much pressure. Allow the syncro’s to match the gear speed and as the gear falls to the desired place, you can feel the gears meshing. Then starting accelerating and enjoy the ride. Though, initially, you might find this process a bit complicated; however, with practice you can master it and you are going to find out that changing gear with this system in place, actually takes you a second or two longer than changing with a clutch. The most important thing is that you need to be patient. Try out this process with some normal ICE cars; however, there you have to concentrate harder, since you need to use the gas pedal efficiently to match the motor speed with the speed of the gearbox. Since the ICE motor has much more mass than the electric motor, it is tougher for the syncro’s to overcome this hurdle and therefore, cannot match the speeds. Here, the role of the clutch comes into play; since it nullifies the motor mass leaving the syncro’s to deal with clutch plate mass only. Though an electric motor has lesser mass than ICE motor; however, it has more than the mass of a clutch plate and for this reason you need that extra second to shift gear in a clutchless EV.